This thread is for information on fairs and shows which feature banknotes. One post per event please, which should be kept up to date by the poster. Posts are changeable in this thread, and Old posts are deletable. The post below is always changed to display the latest event. This sale features 157 lots of Irish banknotes, covering a wide range of issues, and includies some very rare Notes. The catalogue can be downloaded from the DNW website. The highlight of the Irish banknote offerings is a nice grade War Code £20, Lot 398, the finest yet seen in an auction. Fresh original Very Fine. There is also a good range of Ploughman notes on offer, including a decent example of a Northern Bank £1 note, Lot 369; Northern Bank £5 note, Lot 370; Royal Bank £10 note, Lot 372; and Ulster Bank £10 note, Lot 373. Additionally, there are also a couple of rare Ploughman proofs on offer. In addition, there is a nice range of Lavery banknotes which include a 1928 10 Shilling note, Lot 375; 1928 £50 note, Lot 384; and several £50 and £100 notes of Type 6 with Brennan McElligott signatures. The Fifty Pound notes of this signature combination are scarcer, and include a note from 1943. There are also some attractive partial proofs of early Lavery notes, and a Ballykinlar £1 Token, Lot 299, a seldom offered item. The highlight of pre-partition notes is a nice National Bank £10 note, from 1908, Lot 318; and a 3 Guinea note, Carlow Bank, issued in 1811, Lot 286. Altogether, a nicely rounded auction with something for everyone. April 6, 2019 includes 80 Lots of Irish notes. The 80 Lots in this sale comprise largely £20 notes. By far the most interesting banknotes on offer are Lot 454, and Lot 455, a pair of war code £20 notes, rarely offered in any grade. Although not graded, both notes are quite nice, Lot 454, dated 8.3.43 looks to be in the VF region; and Lot 455, dated 7.6.43 a bit lower grade. Both dates have previously been recorded, though these two notes are new to the census. Both notes are a considerably better grade than the average seen for this type. A nice pair of rare notes in decent grade. It will be interesting to see what they fetch. There are a lot of £20 notes, both A Series 1976 and B Series 1981-1983 in nice grade, offered as small runs in sequence, as well as some earlier £20 notes, including a 1949 in low grade. Additionally there is a good variety of other denominations 10/- through to £10 offered in mixed lots. The auction catalogue can be viewed on Whytes website and downloaded as a pdf. 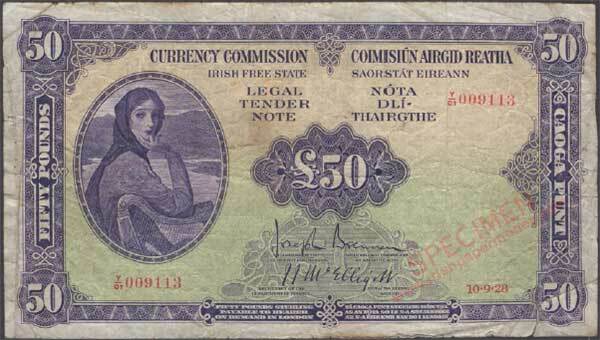 DNW have a Papermoney auction coming up with some interesting Irish notes in it. Whytes, Dublin, have a Limerick Soviet note in their upcoming Collectibles auction on 9th May. It will be interesting to see what it fetches. EDIT: This Limerick soviet 10 Shilling note fetched 1600 Euro plus fees. June 13, 2015. A selection of Ploughman notes, including a few rarer items. There are 38 Ploughman notes in the Whytes sale, with a few nice grade notes. Notable Lots in the sale are: 317, a nice 1931 Northern Bank One Pound Ploughman; 318, a 10.6.29 Knox signature Northern Pound—this is a rare note, it will be interesting to see what it fetches. Bot notes are estimated at 2-3K. There is one £10 note in the sale, a washed Munster & Leinster, 1938. Only three of the notes have been recorded in PSS, including the £10 and the Knox Northern £1. They were recorded way back around 1996. There are also some other Irish notes in the sale, the most interesting being a £100, dated 9.12.37, graded at About very fine. This note is rare in such a grade. Nice to see it offered. June 27, 2015. An auction of Banknotes, Coins and Medals coming up on 27 June. The sale includes a good range of War Code notes, 10 Shilling, £1, £5, £10 notes, few low grade Ploughman notes and a 1937 £100 note. The most interesting banknote is Lot 29, a 1937 £100, 17.12.37. Grade VG with an estimate of 650 Euro on it. There is also a C series replacement £50 note, 14.02.96 EEE, estimated at 300 Euro. Both of these are scarce as offered. The most interesting medals in the sale are Lot 15: 1916 Rising service medal in original box of issue, very fine (est 1500); and Lot 17: 1922 War of Independence service medal with "Comrac" bar, very fine in original box (est 500). Amongst the Irish coins, there is a 1928 proof set, Lot 175. Uneven toning, box poor. (est 350). The catalogue is available for download from here. Monday 28 September 2015. An auction of Banknotes, including some interesting Irish notes. The sale includes a nice 1928 £20 note, and 1928 £50,and £100 notes. There are also some nice later Lavery notes, including a nice 1959 £100—Sterling format. Additionally, there are a few pre-partition notes from the Provincial Bank and Ulster Bank. The catalogue is available for download from the dnw website. Saturday 12 September 2015. 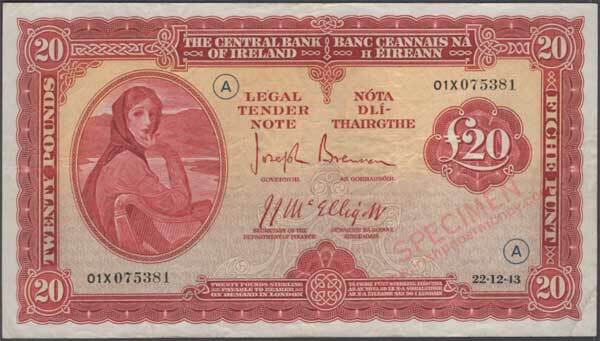 An auction of Banknotes, coins and collectibles, including some high grade Irish notes. The sale includes a nice range of later Lavery notes from the 1970s in high grade, and a 1954 Redmond £10 note in unusually nice grade. There are also some nice B Series and C Series notes in UNC grade. There is also a scarce gVF Royal Bank of Ireland Ploughman £5 note, with the top missing from one edge—it will be interesting to see what this fetches—an intact note of this grade would be in the region of 4,000 Euro. The catalogue is available on the Lockdales website. Lockdales are one to watch for Irish notes. They occasionally have small offerings of interesting material. The royal £5 note didn't sell. Most of the other Irish notes sold for around the estimate prices. October 17, 2015. A selection of Ploughman notes, including three £10 notes. There are 26 Ploughman notes in this Whytes sale. All but two notes are new to the Ploughman Scan Survey. All of the notes are lower grade, generally vg. Monday 7 December 2015. An auction of Coins, Tokens, Medals and Banknotes, including a few interesting Irish notes, and some interesting foreign notes, notably Malaya & British Borneo. The sale includes a nice Bank of Ireland £10 note, 1913, with DUNMANWAY branch on it. Additionally, there is a nice spread of few pre-partition notes and a few Ploughman notes, including a decent grade Munster & Leinster Bank. £10. Enough of a spread to start a decent collection! It will be interesting to see how well these do. The Irish International Coin Fair will take place on Saturday and Sunday, 27 & 28 February, 2016. 100 years since 1916—this is the Coin Fair to be seen at! Spink, London also have an auction of World notes on 12 April, 2016 which has a few Irish notes in it. Lot 428. Red Ploughman Specimen £10, of the type that De La Rue produced as examples of their printing. This one might be more interesting, though. Have to have a closer look at it. Lot 429., £1 1928 Specimen; and Lot 430., £10 1928 Specimen are both also interesting. Place: RDS, Ballsbridge, Dublin, Ireland. DNW are certainly getting the best in Irish notes these days, though Whytes in Dublin are worth keeping an eye on also. Saturday 23 April 2016. An auction of Independence era collectibles, including three Limerick Soviet notes. Fonsie Mealy have rather a good a auction of Irish historical items related to the Independence era, "The Centenary Sale" on 23rd April. The sale includes three Limerick Soviet notes, one of each denomination issued. Lot 371. These notes are interesting, in that the 5/- and 10/- are each numbered 1, the first notes of the issue. The 1/- note is a later nunumbered note. 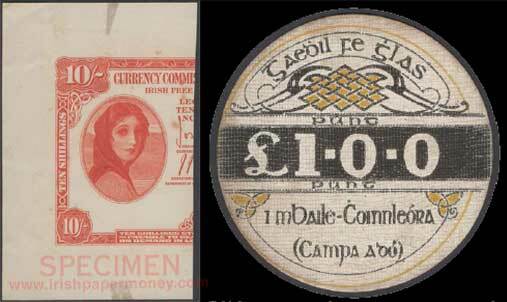 The 5/- and 10/- notes are signed on reverse by Thomas Johnson, Leader of the Irish Labour Party from 1917 to 1927. They are together with an original "Defence of the Realm - Local Pass," for the Special Military Area of Limerick, signed, stamped, and dated 25th April. There are also some Fenian bonds in the sale, including a rare 500 dollar bond, though in very low grade. Whytes have some interesting Irish banknotes in their Eclectic Collector auction on 14 May 2016. There are a few old notes, 72 Ploughman notes, and a selection of Lavery notes, including two 1928 £100 notes in low grade. The most significant item is Lot 325, a pleasing Fine, and a nice example of a very rare banknote. Dated 10.1.44, this note will fetch rather more than its conservative estimate of 4,000–5,000 Euro. Central Bank of Ireland 20 Pounds war code 1944. 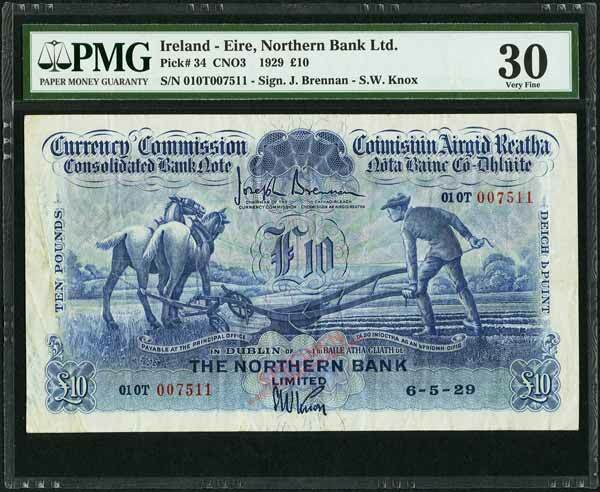 There are 72 Ploughman notes in various grades, including Lot 306, a Provincial Bank of Ireland £10 note, dated 17.7.39, with Kennedy signature. This is one of the rarest signature varieties for the Ploughman series, and is estimated at 1,200–1,500. It will likely fetch around double this figure. 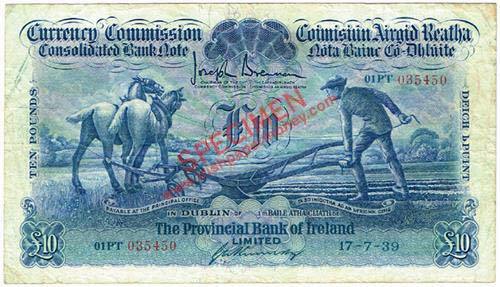 Provincial Bank of Ireland Ploughman 17.7.39. Kennedy signature. Lot 230 is a Provincial Bank of Ireland ledger of approximately cancelled 400 half-notes. An interesting item for research purposes. Also up in the sale is Lot 197, one of the 1995 20 pence test pieces. These two notes each did very well. £10 Ploughman fetched 10,500 plus fees; £20 1944 fetched 9,500 plus fees. Dublin Coin Auctions have regular sales of Irish banknotes, coins and medals as well as other related items. The next auction is 25th June, 2016. Thursday 8 September 2016. An auction of world Banknotes, including some interesting Irish notes. Heritage auctions have a significant group of Ploughman notes, as well as other Irish notes in their upcoming sale on September 8th 2016. It is unusual for a US-based auction to have a large offering of Ploughman notes. Among the lots, there is a nice VF grade Northern Bank £10 note, estimated conservatively at 25,000–35,000 USD. This is the nicest Northern £10 that I have yet seen. There are two about vf notes recorded in PSS, the rest are low grade notes. It will be interesting to see what this note fetches. Also being offered are four Northern £5 notes and 24 Hibernian Bank£5 notes, almost all of which are in the vf to ef region. The appearance of so many £5 notes of one bank together will likely be reflected in weak prices realised—a good opportunity to pick up a decent fiver or two. All of the notes are in PMG grading packets, some of them being overgraded imho. Some of the estimates are too high for the fivers. There are four Ploughman £10 notes, the best of which is the Northern Bank. Munster & Leinster, Hibernian, and Ulster are the other banks. DNW have a much nicer Hibernian £10 note in their upcoming auction. Undoubtedly, the attention will be on the Northern £10, a nice example of a rare note. I remember when there were only three of these recorded, back around 1995. EDIT: pic of the Northern £10 Ploughman £10 Pound note added. There is a range of other Irish notes in the sale also, including some early northern Ireland notes. EDIT: The note sold for $32,900 including fees. January 21, 2017. A selection of Ploughman notes, some Lavery notes, and some seldom seen Hibernian Bank tokens. Whytes, Dublin have an Eclectic Collector sale on January 21 2017. The sale has a scattering of Lavery and Ploughman notes (15 x £1) in it, which are all new to PSS. Of more interest are a group of Hibernian Bank tokens, issued in 1827. These are rarely seen as issued notes, with only proofs and specimens generally being offered. There are also some Fenian and De Valera bonds on offer, some with additional documentation. Monday 24 April 2017. An auction of Banknotes, including some Irish notes. DNW have a decent range of Ploughman notes in their upcoming auction, with a spread of notes from seven of the eight banks, including a Northern £1 and £5. Also in the sale are a few De La Rue Ploughman Specimen notes, including a £20 and £100. There is also a range of Lavery notes covering all eras of the series. May 5, 2017. A range Ploughman notes, including a few rarer issues. There is a good range of Ploughman notes up in the latest Whyte’s auction, around a hundred. Almost all of these notes are new to the PSS database. Whyte’s continue to unearth new material for their auctions. The scarcer banks are well represented with several notes from Northern, Ulster and Royal. this includes a Northern Knox £5. Thera re also some more cancelled issued Hibernian Tokens. 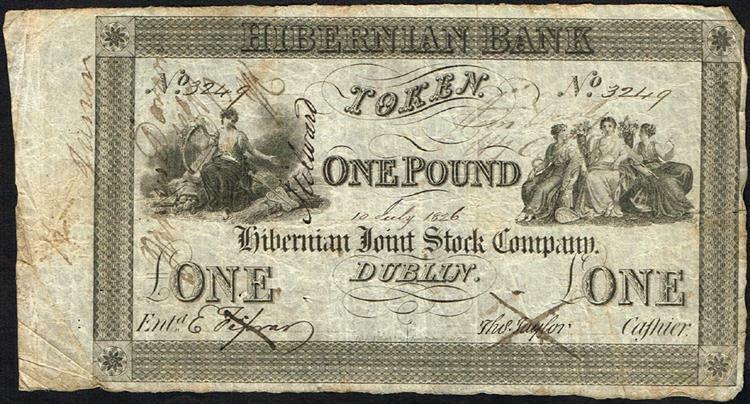 Lot 402: The Hibernian Bank token, One Pound, 10 July 1826. September 25, 2017. Part 1 of the Anthony Lenny date collection of 10 Shilling notes. The sale features part of the collection in 79 Lots. There are a lot of very nice grade Irish Free State notes, and ETO war code notes. An exceptional collection, in terms of the overal grade of the notes, and the scope it covers. It is a while since such a nice offering of Irish 10 Shilling notes has been made in auction. The sale includes a section on Irish banknotes, with a decent selection of Ploughman notes which includes examples from all eight banks. The catalogue is available for download from the Whyte's website, and the lots are viewable online.